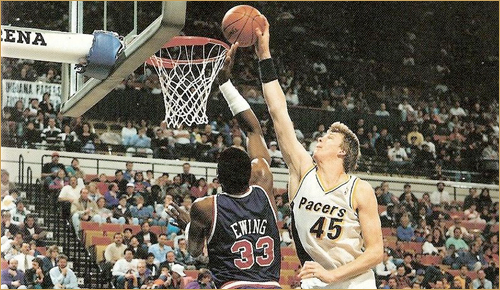 You may ask yourself, “Why, Blog Lord, is there a picture of Rik Smits and Patrick Ewing at the top of this week’s 3-Pointer?” There are a number of reasons, some better than others: firstly, I am going to the Netherlands for my final undergraduate spring break, and the Netherlands has produced exactly one (1) decent NBA player, Smits. This is a celebration of that. Second, ’90s NBA is best NBA, although we might be catching up with this era. Finally, it sort of looks like Ewing might block that Smits shot, which was probably the last great thing any Knick or Knick-related entity did on defense. Elsewhere, Phil Jackson and the Knicks are a teenage pseudo-romance, and the Heat and Pacers, sans Rik Smits, are struggling, but they’ve earned that. Also, we may finally have seen the last of one of the most brilliant point guards in NBA history. 1. Phil Jackson and the Knicks, professional basketball’s version of teenage romantic “talking”: Commitment, man. It’s a tough nut to crack. When both sides are uncertain of the terms of engagement, nobody wants to speak up and lay down the fine print. The Knicks, the teenage girl in this analogy, are offering a lot, but maybe not everything Phil Jackson wants or needs at this point in time. Jackson, the proverbial teenage boy, has always had eyes for the Knicks, but his ex (the Lakers) keeps him hanging on and may attempt a last-minute seduction to keep him away from anything else. They can’t bear the sight of him with another. And then there’s the Nets, another girl who kind of hopes the other two cat fight and lower themselves to below Jackson’s standards. The fact that Jackson is actually engaged to Lakers President Jeanie Buss really throws a wrench into this analogy, but whatever. It seems that Jackson and the Knicks have agreed to terms “in principle” – one of the more inane phrases in professional sports – but anything can happen, because this is the Knicks, and this is James Dolan, and Phil Jackson, et. all. 2. The Heat and Pacers are slightly stumbling: Miami and Indiana, the toast of the Eastern Conference, have both been getting burnt recently, as each team is just 6-4 in its last ten games. Paul George, the offensive centerpiece in Indiana, is averaging just 18.4 PPG in March, down from his season average of 22.1. LeBron is down just a single point, but because of the intense spotlight placed on him and the expectations in Miami, this recent stretch has been disappointing. Fear not, however. Both teams were due for a lull, and it seems appropriate that it happens just prior to the playoff push. Once April comes, the top teams will rest their starters for long stretches (including the Spurs, who do this anyway and still have the league’s best record), and then everyone will be fresh for playoff basketball. 3. Steve Nash has been ruled out for the rest of the season: In a move which may end his career, the Lakers have said that Steve Nash is done for the season. With injuries limiting the 40-year-old, Nash only managed to appear in ten games this season, averaging 7.6 points and 4.6 assists per game, far down from his career totals and way below the sky high Laker expecations. Nash has said he will not retire, choosing instead to see out his contract, and the Lakers could waive him via the stretch provision by September 1st, which would effectively do the retiring for him. If and when Nash does officially retire, there will be many more words, but for now it simply appears as though this will be a sad end to the career of one of the most mesmerizing and talented point guards to ever play this game. Editor’s Note: I will be in Amsterdam from March 15-24. There will be no 3-Pointer next week. A re-adjustment period may be necessary upon my return. Send game tapes and copies of NBA Live 2004 Express Mail, please.